LARGEST SELECTION of discounted Cam Walker Boots, Cam Boots, Fracture Walkers, Cast Walkers, Air Cast Walkers, Air Cast Boots, Aircast Walker Boots, Camwalker, ROM Walkers, and Pediatric Walker Boots. LOWEST SHIPPING COST GUARANTEED. Specifically designed to meet the needs of the higher risk diabetic patient, the XP Diabetic Walker System features the XP Diabetic Walker. 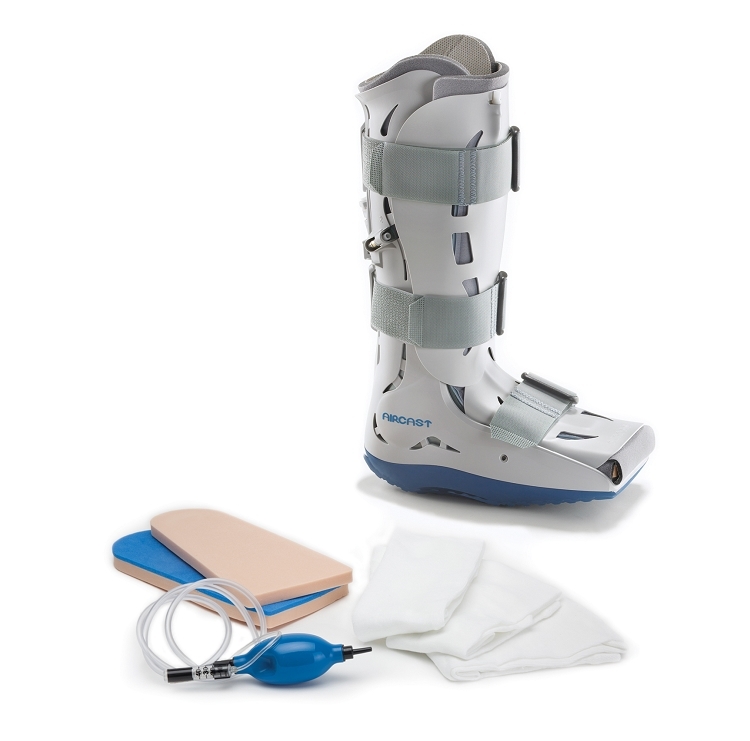 Similar to the XP Walker, the XP Diabetic Walker incorporates a high rocker sole for maximum off-loading of the diabetic foot and two insoles (one Impax Grid and one Plastizote) to help eliminate pressure points. These insoles, when combined with the semi-rigid shell and full aircell coverage, also helps regulate shear stress. The Walker's shell/aircell/rocker design maximizes plantar unloading and provides protection and immobilization. A specialized Hand Bulb with Pressure Gauge is included with each System to measure individual aircell compression. This precise measuring ensures regulated aircell inflation for neuropathic patients. The XP Diabetic Walker System is an ideal alternative to total contact casting. Unlike casting which requires costly and time consuming removal and application during skin and wound examinations, the XP Diabetic Walker can be easily removed and reapplied time after time. The XP Diabetic Walker can be secured closed with the Aircast Brace-Lok to help monitor patient progress. Walking Brace Extension Straps are available to increase the strap length by 4" (10 cm). Additional insoles and stockings are available in the XP Diabetic Walker Impax Replacement Kit or the XP Diabetic Walker Replacement Kit.